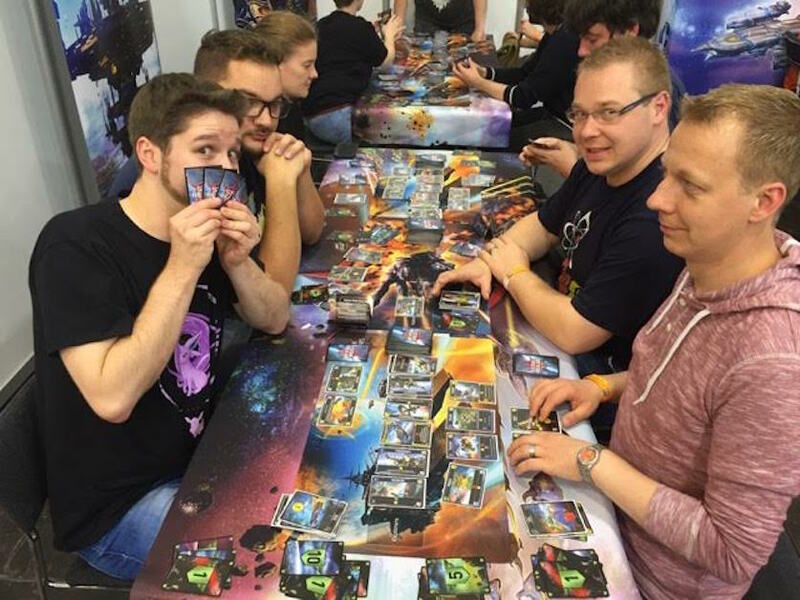 Typically Star Realms tournaments are run as 2-player games. Multiplayer tournaments are possible, but we don’t currently have guidelines for such events. The first thing you should be familiar with is the Swiss Pairing system. The basic idea of swiss is that people should be randomly paired against a player with the same or similar record. So somebody that wins against their first two opponents will face somebody in round 3 that has also gone undefeated, whereas a player that has not won against anybody will play someone with the same record. A number of smaller events. Players sign up throughout the day. Whenever you get 8 players, start a single-elimination 8-person event. This is ideal if you’re at a convention where people might not want to commit the time to play in a large event. It also doesn’t require the use of tournament software. We don’t have software specifically to run our tournaments (coming soon) but there are a few free programs online that you can use. It’s possible to do this by hand, but unless you’re running a single-elimination tournament, it’s not a good idea. Matches are single games, using the base set only. Note, if Colony Wars is available, you can use that. If you have both, you can alternate Base Set and Colony Wars, and the players play with the set that’s on their assigned table. Before the first round, make sure you have a copy of the game for each table. Leave the set at the table each round, and the players will sit and play without having to bring their own cards. You don’t have to play every card in your hand. Those are the basics. Star Realms tournaments are relatively easy if you can handle the logistics.